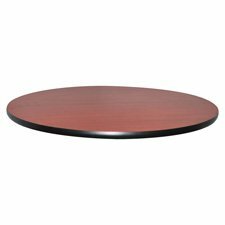 Round tabletop is a part of Lorell Hospitality Table Collection for convenient and affordable Breakroom furnishings. 1-1/4" laminate top with durable, vinyl T-Mold edge offers a stain-resistant, scratch-resistant, smooth worksurface with no grommet. Cherry laminate covers a sturdy, 45 lb. high-density particleboard core. 42" diameter tabletop includes predrilled hole for easy mounting of the X-leg base (sold separately). Tops and bases are ordered separately.